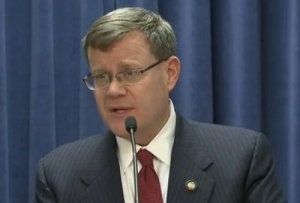 North Carolina House Speaker Tim Moore (R-Cleveland) has hired a high-profile criminal defense attorney as he prepares to handle separate requests from state and federal investigators. In an interview Monday night, Moore confirmed to WBTV that he had retained attorney Colon Willoughby, who spent nearly three decades as Wake County District Attorney. Moore said he retained Willoughby to review questions that have emerged about work he has handled in his private law practice that may have related to legislation with which he is involved. The Raleigh News & Observer reported in September about a contract Moore had with a Triangle-based pharmaceutical start-up that prompted current Wake County District Attorney Lorrin Freeman to request the North Carolina State Bureau of Investigation to review. Freeman has clarified that she did not request an investigation but did request agents review Moore’s business arrangement and connections, if any, to his legislative work. “I hired Mr. Willoughby to look into this and what he’s done is actually confirm that I’m not the subject of an investigation,” Moore said. Moore did not elaborate on the nature of the work Willoughby had done on his behalf. Lindberg, as you will recall, is a Triangle businessman who has funneled hundreds of thousands of dollars to the campaigns of a number of prominent state officials — including Insurance Commissioner Mike Causey and Lt. Gov. Dan Forest. The contributions have been the subject of multiple investigations.